Violent crime was down in 2009 in Milwaukee, marking the second straight year of sustainable decreases in crime in the city. Chief Edward A. Flynn on Thursday, January 21, 2010, announced that violent crime was down nearly 13 percent from 2008 and 20 percent from two years ago. 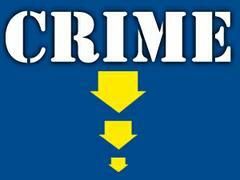 Additionally, total crime is down 7.2 percent from 2008 and 12 percent from 2007. In perhaps the most impressive decrease, auto theft dropped by a quarter over 2008 and 37 percent over the last two years. To put a human face on the crime numbers, Chief Flynn pointed out that there were 3,207 fewer crime victims in 2009 than in 2008, and 5,570 fewer crime victims over the last two years. These trends show that the focused work of the men and women of the department is paying off. Nationally, crime decreases in large cities are boding well for entire states. While the crime decreases took center stage, Chief Flynn said he his cautious about the future given budget cuts at the state level that are allowing for the early release of prisoners. Milwaukee Police report that 14 percent of its arrests in 2009 (nearly 4,800 people) were of those who violated their parole or probation. Additionally, 15 percent of those were arrested for violating parole or probation more than once. Currently, about 12,500 people in the city of Milwaukee are on some type of supervision.